Rahul Gandhi's nomination from Wayanad followed by a roadshow where the Congress chief and his sister Priyanka Gandhi Vadra. Rahul Gandhi was seen helping journalists who were injured at the roadshow in Wayanad. 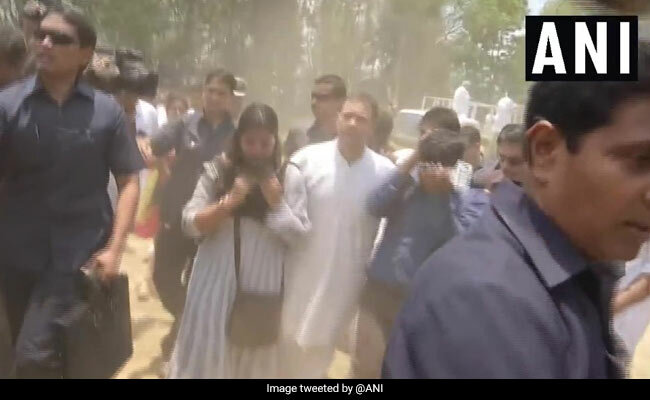 Congress chief Rahul Gandhi and sister Priyanka Gandhi Vadra reached out to help a few journalists who were injured while covering his election campaign and filing of nomination in Kerala's Wayanad on Thursday. Three journalists had minor injuries after a portion of a media vehicle at Rahul Gandhi's roadshow broke off. Rahul Gandhi on Thursday filed documents to contest the national election Wayanad. He landed there by a helicopter this morning, along with Priyanka Gandhi and headed to the district collectorate office in Kalpetta. The nomination was followed by a roadshow in which a massive crowd of supporters gathered on both sides of the road and greeted the brother-sister duo as they stood on a truck and waved at the crowd, marking the beginning of Rahul Gandhi's Wayanad campaign. Security personnel had a tough time controlling the crowd to clear the way for the vehicle. As the truck inched forward, Mr Gandhi was seen shaking hands with many elated supporters. People were seen clicking photos on their mobile phones and waving flags of the Congress party and its ally Indian Union Muslim League (IUML). Mr Gandhi later said he would "not say a word against" the ruling Left. He also said he was fighting from the north as well as the south to counter attempts by the BJP and its ideological mentor Rashtriya Swayamsevak Sangh (RSS). Heavy security was in place in and around the collectorate ahead of the high-profile visit of the Congress chief. The hill district of Wayanad is the second constituency, besides Uttar Pradesh's Amethi, from where Rahul Gandhi will be contesting the national election that begins next week.